Have you ever sat down at the end of the day and thought, “Wow, I need a break!” I am sure that young children feel the same way, and maybe for many of the same reasons. Our classrooms are a nonstop assembly of activities. Dynamics change as we move throughout the day with children arriving and departing and teachers rotating in and out. Even during nap times there are papers to fill out, planning to do and other preparations. There is so much going on that sometimes I feel we forget what’s on the other side of door for the children; we forget to ask how what is going on at home. Reminding ourselves that children can feel overwhelmed with all of the events filling their days, both in child care and at home, can help us better understand their emotions and behavior. The most important thing you can do to better understand the children in your care is to talk with parents about what is going on in their lives. Go further than the usual, “Hello, how are you?” It will help you to build stronger, trusting relationships with parents. It shows that you care about them as a family and for their well-being. When you notice a child saying a particular phrase or acting a certain way, don’t feel afraid to ask the parents or family members about it. Phrases such as, “I noticed Fara talking a lot about concrete this week,” or “Tom has been watching the infants with a lot of curiosity lately” can be great icebreakers in starting a conversation with parents. When a child’s emotions and behaviors change dramatically it could be a clue that something is happening in their lives. 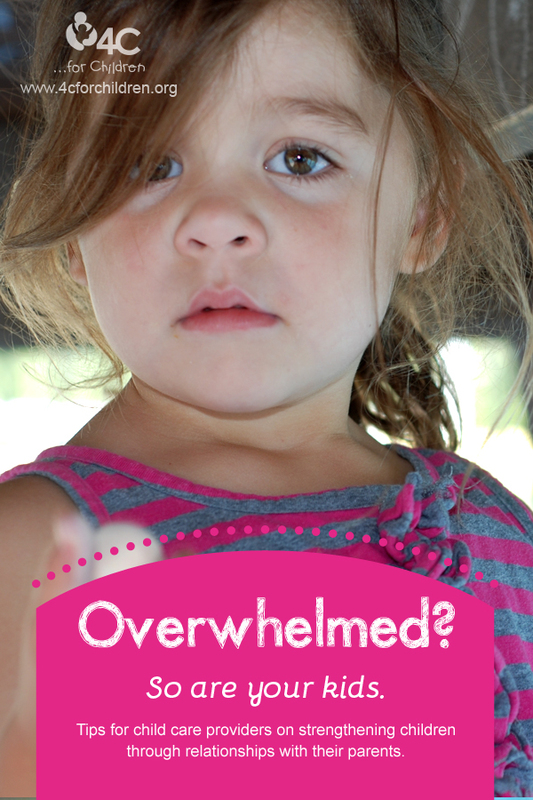 Children respond to stress and feelings of being overwhelmed the same as adults. Checking in with the other adults in their lives can help alleviate stress on you. So at the end of the day when you just need to take a load off, consider reflecting on those young people in your care. How might you be able to understand them better? This entry was posted in Advocating for Children, Early Childhood, Parents on May 6, 2013 by Josh Craig.